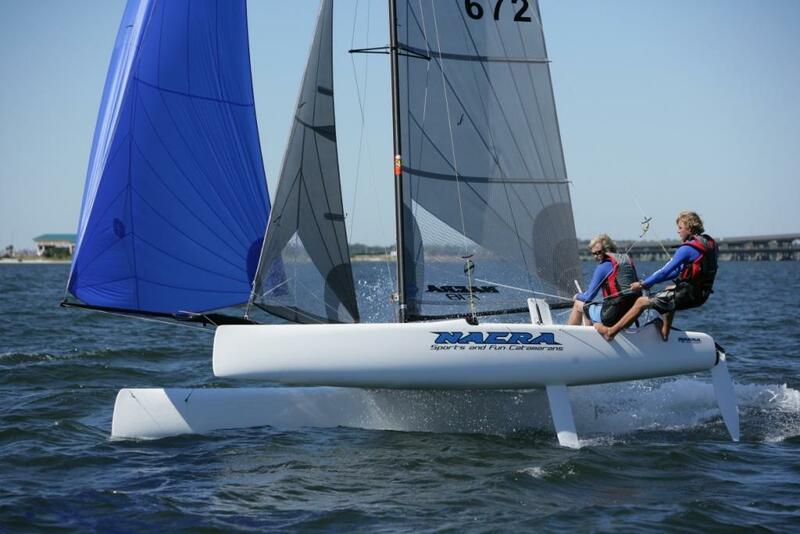 The Nacra F18 Infusion is named after the method used in construction, the only production catamaran made with this modern Infusion system, this allows better material weight distribution within the hulls, yielding greater stiffness where it is needed, and stiffness is speed ! Hull volume, larger than other F18’s, means that the Infusion drives, and drives hard with handling that is rapid and precise. Wave piercing technology reduces drag and improves speed in all conditions, the Infusion wins in big seas and big winds just as well as gliding on a lake in flat water. In contrast to other designs, the Nacra Infusion stabilizes herself at high speed due to dynamic lift, hence reducing pitching to low levels yielding a far more consistent airflow over the sails leading to higher speeds. The fully battened jib, optional self tacking jib rail, the large spinnaker chute, the Harken cunningham downhaul system enables total mainsail control, ask your dealer for the options. You need add nothing ! It is all there!! The high aspect dagger boards get you high upwind, the rudders are responsive and positive, trampoline is tightened from all four sides giving a firmer, drier, cleaner spacious platform. The sophistication of Performance Sails and the wing mast shape complement each other perfectly to allow you to improve your results. This boat is just waiting for you to move through the gears, allow the power to build, glance over your shoulder and the rest are following ! It is up to you, the Infusion will get you to the front of the fleet! Proud Nacra F18 Infusion owners find themselves invincible over others brands, feel free to ask them and ask for a ride! F18 fleet is growing fast, if you want to be at the front, you want an Infusion!! Race results worldwide prove it!